Recently, articles have emerged in both the United States and the United Kingdom concerned over the current politico-intellectual trend toward diminishing the importance and funding of the humanities and social sciences (HSS). For all the reasons the authors indicate, this trend is problematic. STEM (Science, Technology, Engineering, Mathematics) disciplines are of course incredibly important. But they are only part of the collective agenda of intellectual inquiry, and cannot be made to dominate universities without intellectual, economic, and political costs. In this short post, I will leave aside arguments about the intrinsic or societal value of HSS, not because they are trivial (they are not) but because the current wave of humanities and social sciences demotion speaks in terms of global competitiveness and economic productivity. I don’t accept that these arguments should define the boundaries of the debate, but if a case can be made on those or related grounds, then at least parties to the ‘debate’ will not be talking past each other. There are very real, very concrete benefits from a holistic education system. For example, the written communication and argumentation so crucial for corporate strategizing, product/service development, and a range of other economic activities are a strong element of HSS education. Moreover, the ability to understand and engage with socio-political systems—the heart of HSS education—is crucial for understanding the basis of economic competitiveness. For example, look at Home Depot’s remarkable failure in China, in part down to a cultural mismatch, something they might have known earlier had they consulted a cultural anthropologist or political scientist specializing in China. Dynamics of social identity are crucial to modern capitalist marketing, and thus draw heavily on individual and social psychology. IR gives corporate leaders tools for understanding trends in global interactions, which in turn can help them come to terms with their near and medium term risk. These crucial economic functions of the humanities and social sciences cannot be provided by simply stocking some service departments to offer a few classes on literature, sociology, anthropology, psychology, or IR. It requires training a variety of students who then come together in a variety ways in the political economy to produce a variety of economic outcomes. Ironically, given the market orientation of those who want to reduce or eliminate the humanities and social sciences, their efforts to drive forward one particular type of knowledge runs a deep risk of producing a market failure. Human systems, of which economics is a part, are fantastically complex. If the American (or European or Japanese or Chinese) economy is to excel, it needs people who can engage with all the aspects of politico-socio-economic system. Efforts to restrict, or even privilege, STEM runs the risk of producing a workforce that is too narrow and unable to generate the creative combinations of ideas that have brought the global political economy to where it is today. The consequences of HSS attenuation extend beyond the political economy to policymaking. Here I am thinking about Heather’s observations regarding the Ideology of Technology, notably that there is a technological ‘fix’ for socio-political problems. HSS training provides a crucial antidote to materialist (as opposed to social) perspectives that emphasize a problem-solving agenda in which there is a singular (or small number of) ‘right’ answer—usually grounded in technology. The idea of multiple right answers, or even a multiplicity of partially right answers that are in tension with each other sits easily with HSS modes of thinking. The importance of this style of thinking is difficult to overstate; multiple perspectives with many partial solutions characterizes the socio-political world. Even if there is a ‘right’ solution to a problem at a moment, decisions produce unintended effects as social systems shift in unpredictable ways but path dependence makes reversing the earlier decision difficult or impossible. HSS pushes us to recognize these realities and thus provides a crucial logic for making sense of the world that much be combined with techno-materialist orientations, with each providing strengths where the other is weak. But in the absence of such a balance, policymaking bears terrible costs. We can see such costs of an unbalanced Ideology of Technology today. For example, look to the failures of Middle East interventions. While drones provide a neat technological fix to killing al Qaeda members in Yemen, they do not solve the underlying socio-political problems in the region. Likewise, the over emphasis on materiality encourages policymakers to use US Special Forces in an ongoing counter-terrorist whack-a-mole across the Middle East that neglects the underlying social and cultural factors that produce political violence. In Afghanistan and Iraq, techno-materiality failed the military in terms of managing cascading socio-political instability, necessitating a reincorporation of social scientific perspectives through the Human Terrain System. A month ago, Stanley Fish wrote in his New York Times blog about the rise of the corporate university and the dark future for the Humanities. Last week, the Chronicle of Higher Education reported that the legislators in the State of Georgia object to funding faculty research ‘deemed unnecessary.’ This trend is disturbing and damaging, not only to the finest university system in the world, but also to the ability of universities to contribute to society in a meaningful way. The Humanities and the varieties of research areas that arise out of these traditions are valuable in their own right, utilitarian concerns aside. Would we be better off today without the work of philosophers Jean-Jacques Rousseau, Immanuel Kant or Bertrand Russell? This point is not my central concern here however. What Fish laments, and the comments of the Georgia legislators imply, is that there exists a sense that the humanities—philosophy, history, literature—do not serve a utilitarian role, that they are ‘unnecessary.’ This belief could not be further from the truth, and I make this claim, not as a scholar of the humanities, but as a scholar of international relations—a social scientist. The claim that the Humanities do not serve a utilitarian or policy purpose is rooted in the belief that human societies can be managed without regard for the very things that make them human. Societies, and the people within them, are influenced and shaped by their individual and collective pasts and the ideas generated within and without society cemented in poetry and prose, fiction and nonfiction. Utilitarian efforts to understand and explain policy, the mechanisms of governance, and the interactions of societies cannot be undertaken independently of these humanistic elements. We in the social sciences—particularly in the study of International Relations, that most policy-oriented of the social sciences—rely on the work of the Humanities every day. An example is in order. Iran, having just launched a satellite, is forefront in the news today. I am certain the Georgia legislators would find necessary research in International Relations focused on how the United States, and the international system, should deal with Iran. But, can we answer this question without understanding Iran’s history and how that history is propagated in society through texts, art, and songs? This history, as well as the arts and literature that perpetuate and propagate it throughout society, shapes how Iranians see themselves and how they see the outside world. These views are fundamental to understanding why Iran acts as it does and what effect—constructive and destructive—various policies may have on Iran’s future choices and behavior. 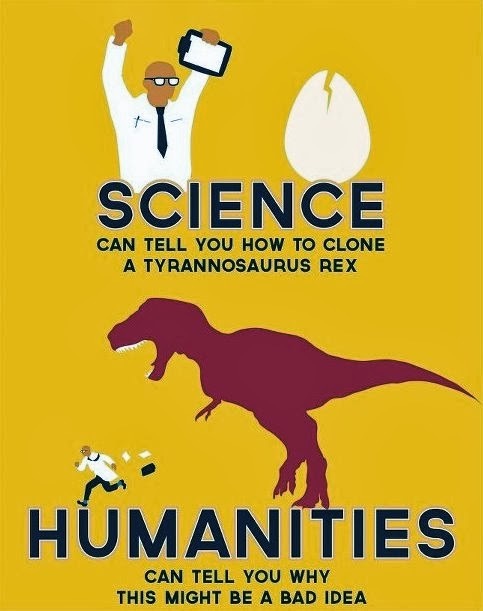 The Humanities play a critical role in a wide variety of disciplines. Today, we struggle to grasp how to deal with the economic crisis. In our effort to find a solution we turn to history: the Great Depression and Franklin D. Roosevelt’s policy response in the form of the New Deal. Without historians to study that era and its lessons, we would have precious few intellectual resources available to bring to bear on our current crisis. Even in the natural sciences—physics, chemistry, biology, and astronomy—so seemingly divorced from the humanities have learned valuable lessons about the process of scientific investigation and discovery from the work of historians like Thomas Kuhn. Engineering, a field defined by its utilitarian purpose, depends at least in part on the imaginings of science fiction literature for ideas about what might be possible, and how society might make use of those possibilities. The United States has the finest university system in the world. It is the finest because scholars study the entirety of the human experience and existence. For-profit institutions of higher learning—Fish cites the University of Phoenix—are not true universities but trade schools in a new guise. There is nothing wrong with that; we need trade schools as much today as we ever did as technology progresses at a lightning pace. However, we should not confuse the contributions to society of universities and trade schools. Universities generate understandings and explanations of where we have been, where we are, and where we might go. The Humanities are integral to that process, and we need to defend them and their funding both for their own value and for what they contribute to more utilitarian pursuits.